The Supreme Court Tuesday voted 4-4 to uphold mandatory union dues for teachers and other public employees, at least for the time being. Justices issued a short, unsigned opinion saying that the lower court’s opinion “is affirmed by an equally divided court.” High court votes that end in a tie affirm the lower court’s ruling — in this case, the 9th Circuit’s finding that requiring public employees to pay at least a portion of union dues did not violate the First Amendment. Plaintiffs fighting the mandatory dues had been optimistic following January oral arguments, when a 5-4 decision in their favor seemed likely. That calculus changed, however, following the death of Justice Antonin Scalia in February. The group representing California teacher Rebecca Friedrichs and the other plaintiffs said later that in the event of a tie they would ask a full nine-member court to rehear arguments. Shortly after Scalia’s death, Terry Pell, president of the Center for Individual Rights, the group backing the plaintiffs, told The 74 that only the Supreme Court can give the final answer in such an important case. “The idea of a smoothly running democracy depends on getting these kinds of fundamental questions about individual, constitutional rights answered in a timely fashion,” he said in February. When the court will be at full strength again — and how a ninth justice could affect Friedrichs’ 4-4 tie — is unclear. President Obama has nominated Merrick Garland, the chief judge of the U.S. Court of Appeals for the District of Columbia Circuit, but Senate Republicans have refused to hold a confirmation hearing. They argue the appointment belongs to the incoming president. The current law governing mandatory dues was established in a case from the 1970s known as Abood. The Supreme Court said states could not require public employees to be members of unions or for them to fund the portion of dues that pay for overtly political activity. Instead, those who oppose the unions pay what are sometimes called “fair-share fees” or “agency fees” to pay for collective bargaining and other traditional labor activities. The case hinged on whether requiring employees to support the union violated the First Amendment by forcing them to back opinions they didn’t support. The Abood court’s rationale was that requiring “fair-share” fees prevented employees from “free riding” and getting the benefits and protections of generous contracts without contributing financially to their collective bargaining. Plaintiffs have argued that activities deemed traditional labor activities, like advocating for raises or better benefits, are inherently political when public funds are at issue. Outside groups supporting the plaintiffs argued that particularly in the realm of education reform, union arguments for policies like last-in, first-out dismissal or tenure are inherently political. 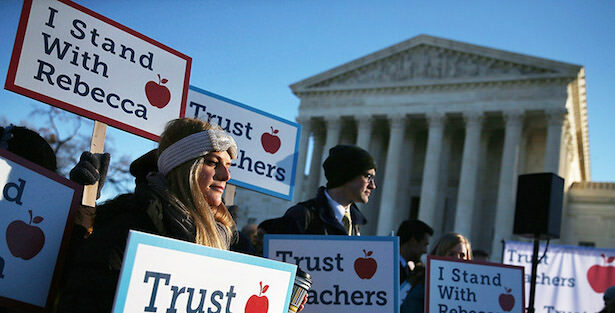 The case had the potential to limit the impact of teachers unions and others across the country. About half of states require employees in unionized workplaces to pay at least some dues. The other half are what’s known as “right to work” states that allow employees to opt out of unions completely. Union leaders praised the ruling. “This decision is a victory for educators and all public employees, but most importantly a victory for the millions of students of California and across the U.S. By having the ability to join together to make our voices heard on issues that affect all of us such as a quality, safe, and healthy schools for our kids, we ensure that our public schools remain strong and our students get the quality public education they need and deserve,” California Teachers Association President Eric Heins said in a statement.